Assembly & Packaging - Tesh, Inc. The Tesh Vocational Center strives to be a best value service provider for your business needs. For many small companies and start up companies, best value may mean saving you money by providing space and trained consistent workers to meet your varying needs. For a large company best value may mean being able to produce large volumes of work to meet a surge without either putting your workers into overtime or having to pull workers from other pressing needs. Whether yours is a small start up business with unpredictable staffing needs or a large company with space issues, Tesh can meet your assembly needs in a cost efficient way. The Tesh Vocational Center is the perfect hand labor option for many businesses in the North Idaho and Spokane market place. Need to replace a label on a shipping container full of product? Call Tesh! 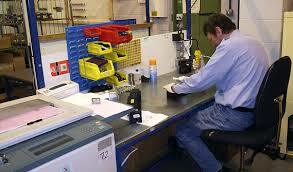 Need 250,000 parts per month assembled but don’t have the space required to do it? Call Tesh! Need to assemble 500 parts per quarter and don’t want to retrain temporary workers each time? Call Tesh! Need to package 5000 samples of a new product and don’t want to work on the kitchen table? Call Tesh! We can offer bagging, boxing, clam shell packaging as well as assembly of your parts. Pricing: All services are quoted on a per piece basis so there will be no surprises at the end. Call our Manager of Commercial Services or the Vocational Center @ 208-765-5105 to learn more about how we can help you.